One of the most popular products in the Volkswagen lineup over the last few years has been the dependable Jetta. 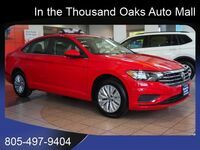 Even though we aren't halfway through 2018, the 2019 Volkswagen Jetta is here and it's better than ever. The Jetta has always been known as a compact, stylish, highly-efficient car. The 2019 model averages up to 40 highway MPG—yes, 40. Even in the city, drivers will get 30 MPG which combines for 34. No, it's not a hybrid, but Jetta drivers ought to save more money at the gas pumps than most of their neighbors. Five total trim levels are available for the new Jetta. The base trim, the S, comes with a generous amount of standard features including chrome accents, a rearview camera, LED headlights and taillights, and a 6.5-inch front monitor. The starting MSRP is $18,745. If you want to get heated front seats, dual-zone climate control, and a panoramic sunroof, you can upgrade to the SE trim. The SE comes with an eight-speed automatic transmission as opposed to the base model's six-speed manual and it starts at $22,155. The 2019 Jetta comes available with the signature Volkswagen R-Line® package. Drivers will have to pay just a bit more ($22,995) and will get exclusive features like black mirror caps, R-Line® badging, dual exhaust, gray Trenton aluminum-alloy wheels, and fog lights. The final two trim levels are the SEL and SEL Premium. They are priced at $24,415 and $26,945, respectively. The former builds off the SE and features additions like LED projector headlights, rain-sensing windshield wipers, an auto-dimming rearview mirror, adaptive cruise control, and BeatsAudio sound with a subwoofer. The SEL Premium, meanwhile features exclusive sport comfort, ventilated seats, integrated navigation, and an eight-inch touchscreen display. 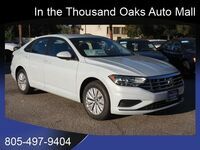 Interested drivers should come by Neftin Westlake Volkswagen and check out the 2019 Jetta for themselves. We can go over all pricing specifics and get you set up with a test drive. We hope you stop in soon!